Reluctance to deal with problems makes you look ineffective, weak, and self-protective. The problem isn’t the problem. Avoiding it is. Inaction increases fear; action increase courage. Let it work itself out. I’ll make it worse if I try to make it better. The difference between exceptional and average leadership is the resolve to quickly deal with problems that matter. Silence implies secrecy. Secrecy destroys trust. Tolerance in the beginning becomes approval in the end. You get what you tolerate. Bonus: Delay amplifies difficulty. The longer you wait the harder it is to act. If you’ve seen this sore before, you already missed the easiest time to heal it. Be transparent. Everyone knows profits are down. They’re waiting for you to name it. Identify and describe behaviors that create forward movement. Describe how committed they are to finding and implementing solutions. Begin with problems; remain focused on solutions. Commit to quickly making things better. The longer you wait the more difficult solutions become. Set expectations. Complete resolution takes time. Ask them to solve it, when appropriate. Stay available. Don’t hover. Weak leaders listen to problems and do nothing. Powerful leaders listen to resolve, solve, and move forward. What problem solving suggestions can you add? Weak leaders always want you to show up with a solution but never provide any input in solving the problem. Always admitting to the obvious cause of the problem… “the elephant in the room”. This will help speed up resolution time rather than dancing around the elephant like it’s a pretty flower (just picture a person dancing around an elephant with their hand over their eyes singing “La La La … I know the elephant is there … la la la … but I’ll ignore the pain of admitting it! La La La”). Another analogy … RIP off the bandaid as soon as possible. Bandaids are temporary solutions that are not designed to last a long time. The faster you rip off the bandaid, the faster you will get to the wound, the heart of the matter, what you need to heal. Thanks Michael. Powerful suggestions. Love the image of dancing around singing La La La. I deliver a seminar called “Dancing with Elephants” I’m going to use your imaginative language. Thanks! I’m actually shocked as to how many ‘leaders’ I’ve encountered in my life who spend most of their time avoiding real problems. Avoid real conversations. Dance around real issues. Avoid the elephant in the room, etc. The very same leaders who will preach about respect, trust, seem to know all of the right words when it comes to the rest of the people living up to it but can’t seem to find a way to actually demonstrate it themselves. Yet they are still considered leaders. I don’t care if they are the President of the United States, the CEO of 10 companies….if they are avoiding problems, present a do as I say not as I do attitude, aren’t honest, and can’t demonstrate the character and behaviors they seem to require in their followers yet can spout them out in word or writing….they aren’t and will never be TRUE leaders in my heart and mind. I don’t care how popular they are. Truth. And yet it still doesn’t appear to be enough for people to actually deal with problems. Perhaps at the heart of it is this: If it weren’t for all the enablers the avoiders wouldn’t get away with avoiding for as long as they do. Quit rewarding bad leadership. Quit enabling bad leadership. Quit conforming to bad leadership. But it’s what is required from followers if leaders don’t take responsibility for their leadership. Thanks Samantha. It’s interesting that some leaders who avoid problems stay in power. I think it’s an issue of culture at that point. Sadly, those who keep pushing to resolve/solve problems in cultures where leaders avoid them become trouble makers! Be careful. If this isn’t a sign that we are living in the frog in hot water analogy, I don’t know what is. What was that speech William Wallace gave in Braveheart? Ok ok. I love my movies yet hopefully you get the point. Does living mean I have to live the rest of my days with my head down, flying under the radar when things go completely against what i value and believe in? When you see your own country headed for a cliff or if we were the Titanic…headed for the big glacier…do we stay silent? Or will we love our country and our brothers and sisters enough to DO something about it even if the very people you CARE about is still under the ‘trance’? When does ‘careful’ become too careful? Thanks for the follow up Samantha. Your connection of love with standing for something is important. One answer to the question about when to stand up is stand up if you are willing to suffer for it. Dan, it is surprising how many leaders avoid problems because they hate conflict. They stay focused on what is ahead and will not acknowledge any problems around them. Experiences doesn’t make us better leaders, but evaluating experiences grows us into healthy leaders – including evaluating problems. Great leaders lean into problems not run away. Thanks Dan for revealing powerful truth that every leader deals with. I hate the thought of being a problem centric leader/organization. But, if we don’t deal with problems eventually we become problem centric. Big problems were once small. Solving a problem before it grows big is key to solving all types of problems. Ignoring them will do no good; it’s like closing our eyes and thinking everything is gone. In fact, nothing is gone except time. Problems do not go away by ignoring them. Thanks Ken. Keep moving forward my friend. 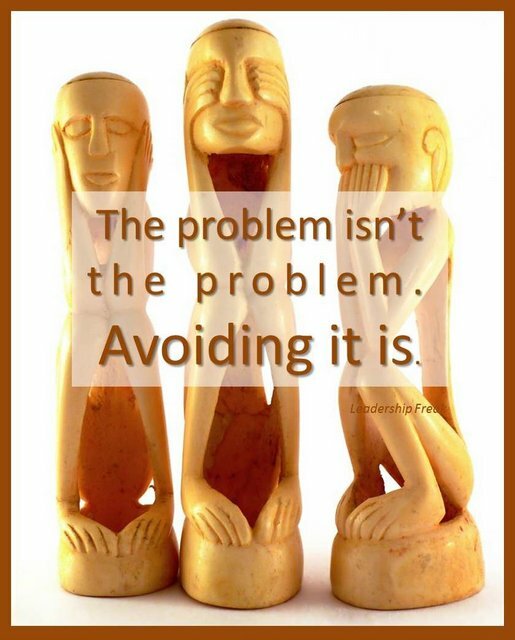 Avoiding problems is the exact opposite if leadership. We are placed in these positions because there will be problems and leaders are expected to solve them. An additional problem solving suggestion might be to recognize individuals that solve problems. That could help get more involvement from your team. Often people resist those who want to go against the flow, who admit and wish to work on problems. Non-leaders and leaders alike are overwhelmed with problems, so they don’t want leadership. Perhaps complacency is often a front for deep fear. So they may even oust such a leader (which obviously give plenty of contrary impetus to the would be leader). Therefore, the part I like best in your post is the “define success.” Sometimes people don’t see the problem; even more often they don’t see a vision of what could be. For example, you may have a staff person who comes by with questions on how to do their job far more often than anybody else in the department. The surface problem is whatever particular question they have. However, there is likely a deeper problem that needs attention. If the staffer is constantly asking technical questions in one area (e.g. how do something in Microsoft Excel), then a better solution would be recommending a good training course.